Slowly carved from the sandstone bluffs by Home Creek, with 50 foot fern-lined walls, and nearly constant dripping precipitation from the forest floor above, it’s no wonder Steven Spielberg chose Fern Canyon as a shooting location for Lost World: Jurassic Park. 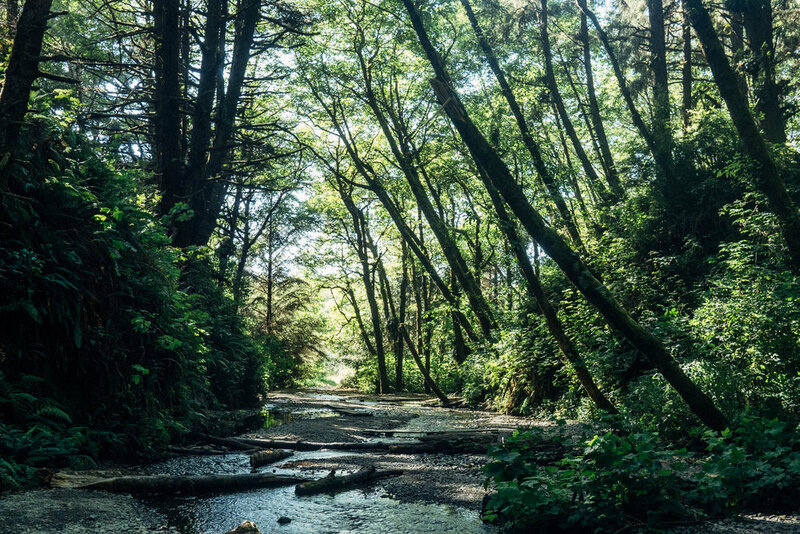 Lurking on the fringes of an already-impressive natural area, Fern Canyon could be thought of as an amendment to the Redwoods National and State Parks. Out of the way, lacking the signature coniferous giants, and down a winding dirt road through old growth forest prohibitive to RVs and trailers, many skip right over Fern Canyon in the search of the standard tourist fare. That’s what happened to us. After navigating the dusty road through the fading daylight, we arrived at Gold Bluffs Beach Campground only to find the dreaded “Campground Full” sign. Down but not out, we unwittingly drove to the Fern Canyon Trailhead, but went the opposite direction to the beach before proceeding on our way. It wasn’t until we returned home and learned of Fern Canyon’s astounding beauty that a plan was made for a return trip. 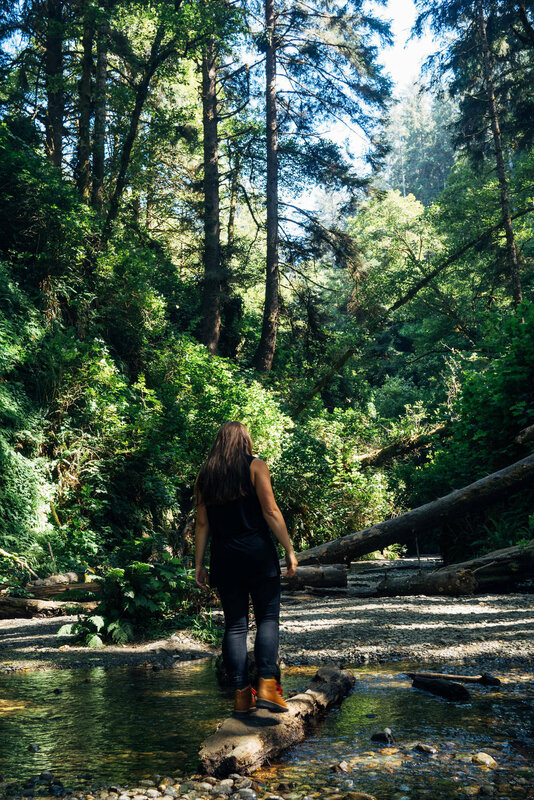 Fast forward one year, now armed with a campground reservation, an informed itinerary and time to explore, we were able to experience Fern Canyon. While trekking up the flat canyon floor and crossing multiple primitive foot bridges, we soon realized a handful of tips to pass along to the next canyoneers. Aside from getting the best light for photos, the trailhead has a tendency to get busy in the summer. Beat the rush and arrive at the crack of dawn or wait for everyone to leave for some peace and quiet. We got there late in the afternoon and found quite a few open parking spaces, and by the time we left there were only a handful of other cars in the lot. Just past Gold Bluffs Campground, the road is gated off and closed from about 7pm-7am, so keep an eye on the time. Whether photo, video, or a live Instagram feed, bringing a camera is a great way to remember this unique area. Just remember to put down the iPad selfie stick every now and again to experience the canyon in real life, instead of through a screen. Since the deep canyon has a forest canopy way above, light can be limited, so it could be a good idea to bring a tripod along with you. Thankfully rangers come through at the beginning of each season and place foot bridges over many of the stream crossings. And by foot bridges, two 2x6’s laid across the water that give just enough room to keep feet dry. As you progress up the canyon, these bridges become fewer and further in between, and it’s easy to find yourself up the bridgeless side of the meandering creek. 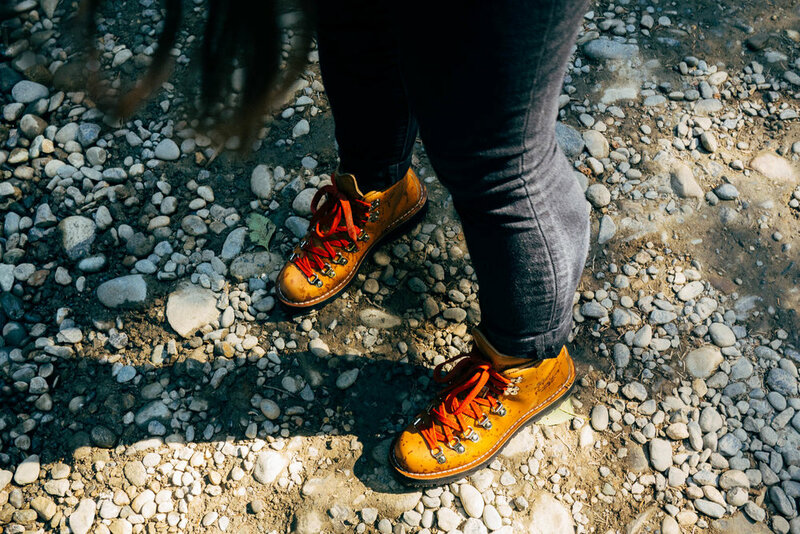 Add in some slippery logs to crawl over and a few forced fords, waterproof boots or even some athletic-type sandals would be a good idea. Since the entire hike is only a mile round trip, there is no need to rush through. 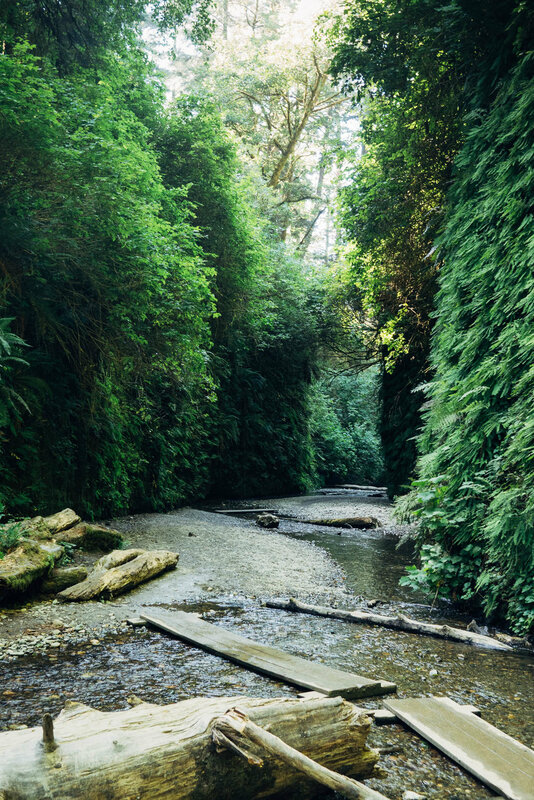 Instead, go slow and take time to notice all the little things going on in Fern Canyon. Watch water drip down from the forest looming above, how the creek has carved a little side cave in the sandstone wall, or how massive fallen trees have bridged the entire canyon in places. We took our time and did our best to try to find details time-crunched visitors overlook. Fern Canyon is located in Prairie Creek Redwoods State Park, at the end of the Davidson Road. The road is narrow, winding, bumpy and full of blind spots, so be sure to watch out for rogue Prius’ and trucks barreling out of the dust clouds. In order to get the full experience, we would definitely recommend staying at the campground a night or two. In the end, we were glad to come back to an area we had to skip over before and spend some time exploring. 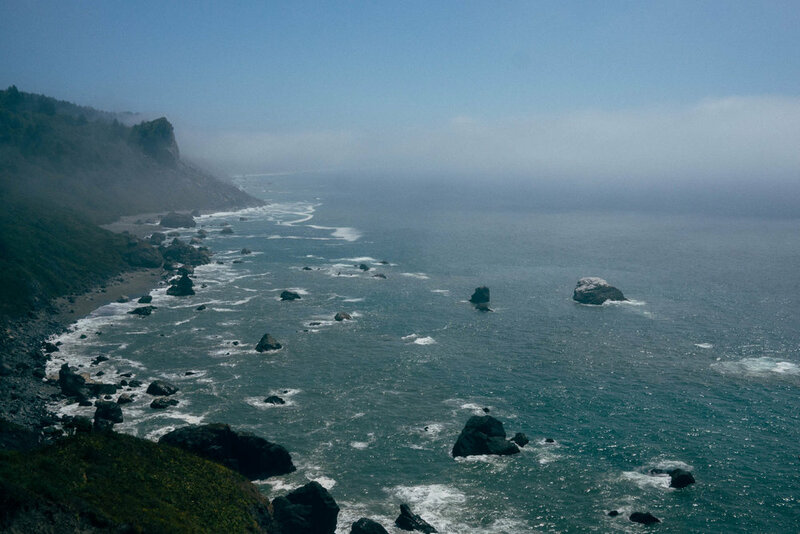 As with busy, time-crunched road trips, coming back and slowing down is not always the case.